Biographical data: Wife of Theban Priest-King Herihor. 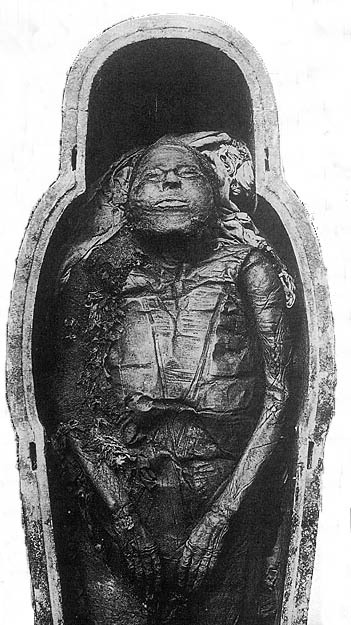 Details: The mummy of Nodjmet was partly unwrapped by Gaston Maspero on June 1'st 1886. G. E. Smith continued the unwrapping on Sept. 13'th, 1906, but only removed the remaining wrappings from areas of the body that were of special relevance to his study of ancient Egyptian embalming practices. 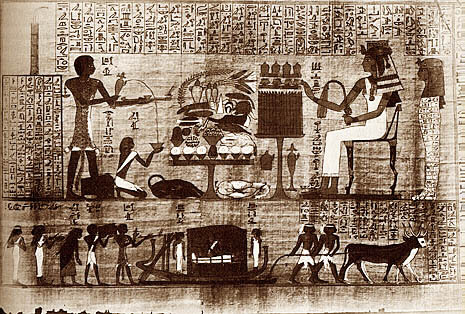 Smith points out that, as one of the earliest mummies from the 21'st Dynasty, Nodjmet's is of special interest because it provides one of the first examples of the newer mummifying techniques initiated by the embalmers, probably inspired by their inspection of earlier mummies that had been restored and reburied in the caches. 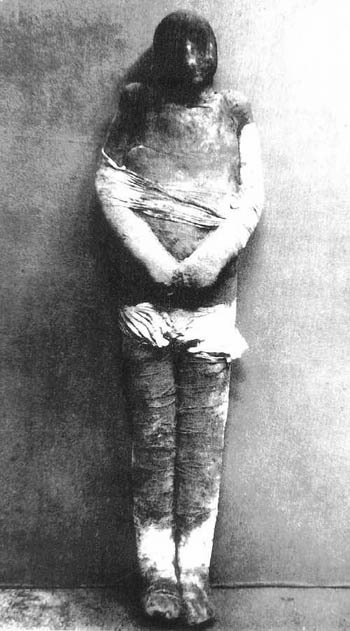 This mummy represents a transitional phase in the adoption of the new embalming methods. No attempt was made to insert materials under the skin via incisions, as in the case of later 21'st Dynasty mummies. Instead, the embalmers applied padding, wax, and other cosmetics directly to the surface of the skin in order to give the mummy a more life-like appearance. In order to fill out Nodjmet's face, her mouth was tightly packed with sawdust and her nose filled with resin. Artificial eyebrows, made of hair, were attached to her face with some type of adhesive substance, possibly resin. A wig was added, which gives the mummy a youthful look by concealing the few remaining gray hairs on the head. The mummy had been disturbed in modern times and had a papyrus stolen from the funerary equipment that had originally been buried with it. 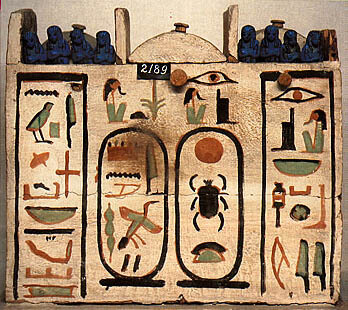 Maspero states in his 1905 Guide du Visiteur (to the Cairo Museum) that parts of this papyrus (which Nodjmet had jointly owned with her husband Herihor) had ended up in the collections of the Louvre and the British Museum. (See photo of papyrus in the British Museum from CP, 175.) The Osiris shroud covering the mummy also concealed ancient damage. Nodjmet had gashes on her forehead, cheeks and nose, probably caused when thieves had cut through her original wrappings in search of valuables. Impressions of jewelry on her right arm indicate that they had found and stolen some objects. Nodjmet's legs were also badly broken, her wrists were fractured, and her left humerus was broken near the shoulder. Original Burial: Occurred around Year 1 of Smendes (see Linen Docket translation below) probably in tomb of Inhapi (WN A?). (ii.) Linen Docket: Dated in context with the inscriptional evidence provided by Linen Docket (iii.) below to Yr 1 of Smendes/PinudjemI. Found on a bandage on the right side of the body: "Nodjmet (written in a cartouche.)" For high resolution photos of Nodjmet see the University of Chicago's Electronic Open Stacks copy of Smith's The Royal Mummies (Cairo, 1912,) Call #: DT57.C2 vol59, plates LXIX, LXX, LXXI Recent color photos of Nodjmet's mummy may be seen at the Eternal Egypt website. from Egypt's Ministry of Tourism. from Ian Bolton's Egypt: Land of Eternity site. 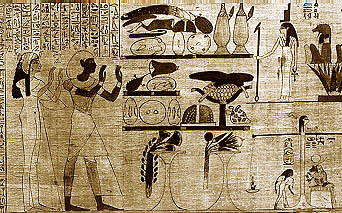 Original Burial: Perhaps in the tomb of Inhapi (WN A). Details: The mummy of Henntawy had been disturbed, and an opening had been dug through the bandages in the region of the thorax and abdomen. 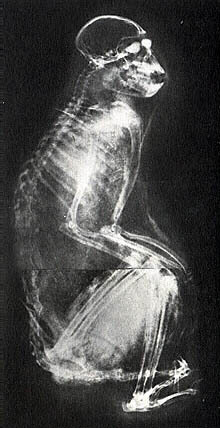 The mummy had an Osiris shroud which appears intact in a photo taken by Emile Brugsch after the mummy had been taken to Cairo (see photo of wrapped mummy from MR1 [Cairo, 1881] and reprinted in KMT [3:4] 46) proving that the hole burrowed into Duathathor-Henntawy's body was already present when the 21'st Dynasty priests re-wrapped her. 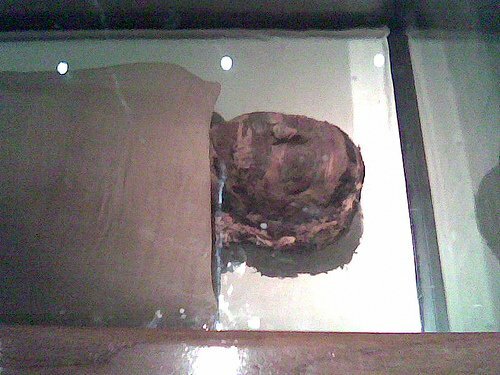 This mummy is historically interesting in that it is one of the first to exhibit the completely evolved version of the new embalming techniques pioneered in the 21'st Dynasty. 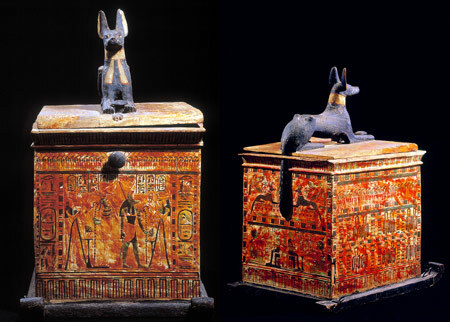 The original embalmers had packed sawdust mixed with resins and bits of linen under the skin of Henttawy's body and face in order to give her a more life-like appearance. This represents a departure from the method used on Nodjmet's mummy (cf. above) in which the padding had been applied directly to the surface of the skin without any attempt at sub-dermal packing. Over the centuries, the sawdust used to "flesh out" Henntawy expanded and unfortunately ruptured the skin. In 1974, her face was restored to a semblance of her ancient appearance by Dr. Nasri Iskander (see Henntawy restored, from KMT [4:3], 27.) X-rays revealed the presence of several amulets still in the wrappings. Smith also records that he found a very fine example of a gold embalming plate covering the embalming incision. This plate was unusual in that, in addition to the customary Eye of Horus, it was also engraved with images of the Four Sons of Horus and bore inscriptions. Tiny holes visible in the upper left and right corners of this object show where string had been threaded. This was circled around the abdomen like a belt in order to attach the plate to Henntawy's body. Photo Credit: RM (Cairo, 1912,) pl. LXXVI. For high resolution photos of Duathathor-Henttawy see the University of Chicago's Electronic Open Stacks copy of Smith's The Royal Mummies (Cairo, 1912,) Call #: DT57.C2 vol59, plate LXXVI (which shows both mummy and gold embalming plate. 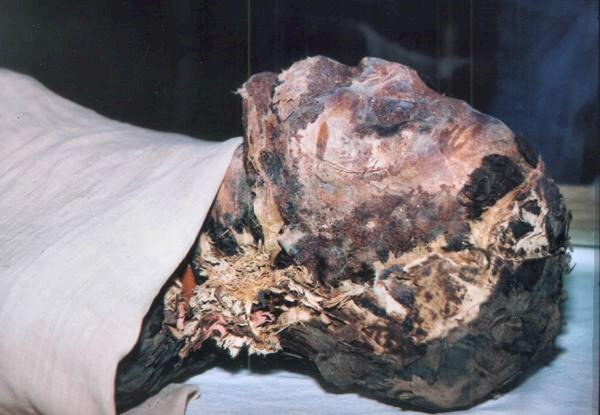 )Recent color photos of Henttawy's mummy may be seen at the Eternal Egypt website. Biographical data: Daughter of Pinudjem I and Duathathor-Henttawy-A (see above). 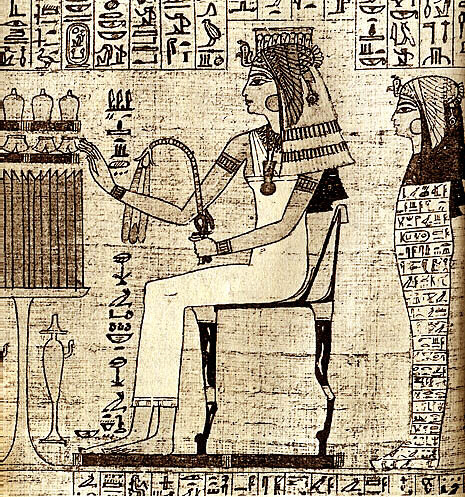 Maatkare-Mutemhet bore the title "God's Wife of Amen," and as such was the second most powerful person in Egypt after the Pharaoh. Details: Reeves (perhaps using MR [Cairo, 1889] as the basis of his report) states that the mummy of Maatkare-Mutemhet had been disturbed, and mentions that only the wrappings of her right arm were slit open by thieves searching for valuables. 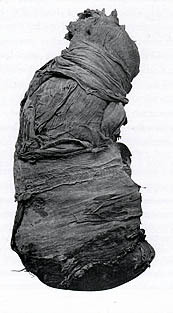 Smith, who examined the mummy in June, 1909, describes the ancient damage as being more extensive in nature, saying that Maatkare's shroud had been ripped from forehead to pelvis (cf. RM, pp. 98 ff.) Her left forearm was broken, and her hands had been badly damaged, one being practically broken off. Smith records that Maatkare's face had been painted with yellow ochre (probably in imitation of the skin color used by artists when depicting aristocratic women on wall paintings--cf. Masaharta, below) and a gum-like material which adhered to the linen shroud. He described the linens used to wrap Maatkare as being of superior quality to any he had encountered in mummies from the preceding dynasties. He also states that the body cavity was filled with sawdust, and that the neck had been packed with fat (possibly butter) mixed with soda in order to give the mummy a more life-like appearance. For high resolution photos of Maatkare see the University of Chicago's Electronic Open Stacks copy of Smith's The Royal Mummies (Cairo, 1912,) Call #: DT57.C2 vol59, plates LXXII, LXXIII (showing close up of hand with rings,) LXXIV. Recent color photos of Maatkare's mummy may be viewed at the Eternal Egypt website. Click here for biographical data from Egypt's Ministry of Tourism. Click here for more biographical data on Masaharta from Ian Bolton's Egypt: Land of Eternity site. 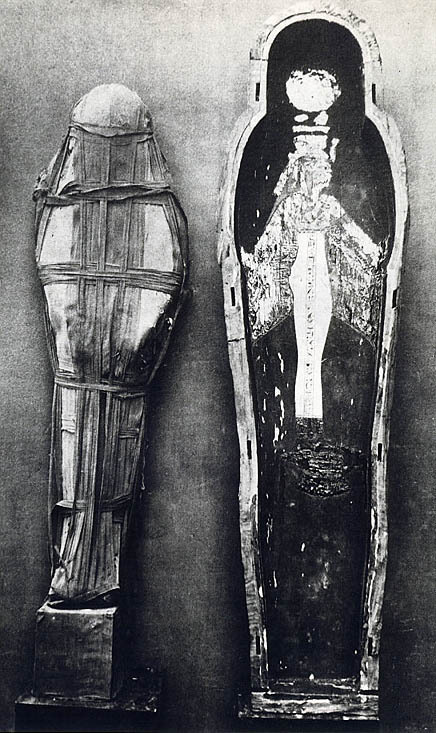 Details: Masaharta's mummy was unwrapped by Gaston Maspero on June 30'th, 1886. It is an unusual looking mummy due to its rotund appearance, which may have been exaggerated due to the expansion of embalming materials (chiefly sawdust, resin, and strips of linen) under the skin (cf. Duathathor-Henttawy-A above.) G. Elliot Smith describes it as having a "grotesque, ourang-outan-like (sic.) appearance." He notes that the face was painted with red ochre of the same color as that employed for representations of men in wall paintings. 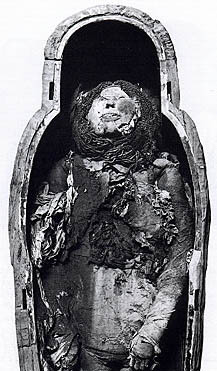 Smith also records that the hands of the mummy, although placed in a manner intended to cover the pubic region, failed to reach far enough to accomplish this due to Masaharta's corpulence. The High Priest's stoutness also necessitated a change in the position of the embalming incision, which in his case was parallel to Poupart's ligament instead of higher up on the abdomen. 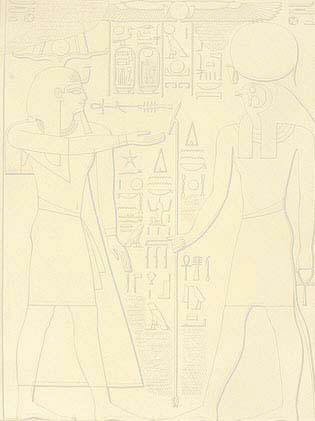 Masaharta's mummy had been disturbed by the Abd el-Rassul's, who stole a papyrus from it. Otherwise, the mummy appears to be intact. Impressions of a pectoral ornament remain in the hardened resins on the mummy's chest, and Reeves also mentions some kind of "braces," which were perhaps used to strengthen or support the mummy in an upright position. 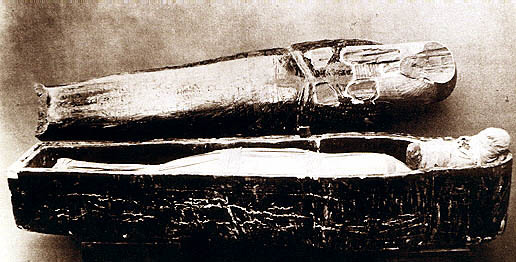 (See DRN, 267, n. 313, where the "braces" or "brace" (JE46953) is described as the lower part of a stucco-covered pole inserted at the time the mummy was originally wrapped. Typically, the term "braces" usually refers to the strips of linen used to hold the shroud in place, but here the term is used differently.) One gold finger stall remains in place on the middle finger of Masaharta's right hand. Photo Credit: RM (Cairo, 1912,) pl. LXXIX. For high resolution photo of Masaharta see the University of Chicago's Electronic Open Stacks copy of Smith's The Royal Mummies (Cairo, 1912,) Call #: DT57.C2 vol59, plate LXXIX. View recent close up photos of Masaharta's mummy. Biographical data: Tayuheret was probably the wife of high priest Masaharta. 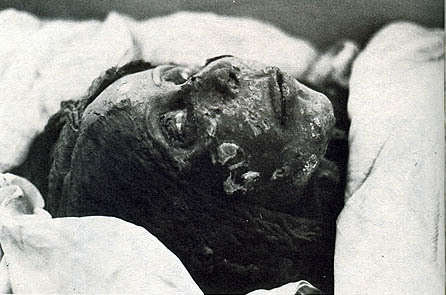 Details: The mummy of Tayuheret was unwrapped by Gaston Maspero on June 29'th, 1886. The resin coated linen carapace which covered her was allowed to remain in place. On July 6, 1909, G. E. Smith examined the mummy, and discovered that the resin used to fashion this carapace had been mixed with sawdust, an ingredient Smith had not previously seen employed in this fashion. He removed enough of this hardened linen to expose the face, but had to leave most of it in place to avoid damaging the mummy. Smith noted that Tayuheret's cheeks had been packed in order to flesh them out. He does not specify the packing material used in this case, but he describes it as being similar to that employed in the mummies of Maatkare and Duathathor-Henttawy-A (see above.) Tayuheret's nostrils had been covered with discs of wax, and a type of nose-guard had been fashioned of wax for the purpose of preventing the nose from becoming flattened and distorted by the bandages. She had been given a set of artificial stone eyes, and her right eye had also been covered by a wax plate. Wax was additionally employed to fill the space between the lips, which Smith described as being widely parted. 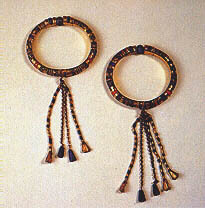 Tayuheret's ears were covered with hair which Smith thought was mostly from a wig. 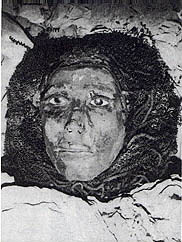 Tayuheret's own hair was mostly white, indicating that she had died an elderly woman. Smith also noted that insects had damaged the skin of the face, especially that of the forehead. This may indicate that an unusually long period of time had elapsed between Tayuheret's death and her embalming. However, her bandages also appear to be pitted with small holes (see photo above) which could have been caused by insects sometime after her embalming. Smith comments that the plate used to cover the embalming incision differs from the engraved plates usually employed during the 21'st Dynasty. It was plain and fusiform, similar to the plates used by embalmers of the 18'th Dynasty. Photo Credit: RM (Cairo, 1912,) pl. LXXVII. 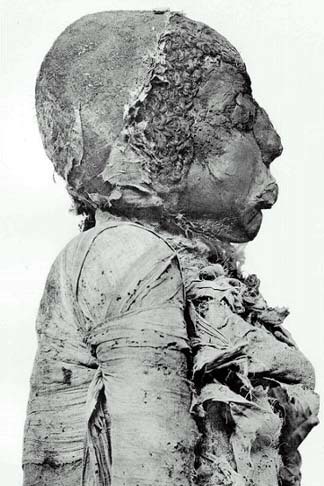 For high resolution photo of Tayuheret's mummy see the University of Chicago's Electronic Open Stacks copy of Smith's The Royal Mummies (Cairo, 1912,) Call #: DT57.C2 vol59, plates LXXVII and LXXVIII. Details: The mummy of Pinudjem II was in a virtually intact condition when found. (See recent color photos here [from Al Ahram], and here [from yusheng on Flickr.]) It was unwrapped by Gaston Maspero on June 28, 1886. Reeves notes that he had been wrapped in an Osiris shroud, and that some of his wrappings had been replaced or patched up in some fashion by a mat made of halfa grass. There were several different inscriptions on Pinudjem II's bandages (see Linen Docket translations below) and a number of amulets and articles of jewelry, including two bracelets, were also found in the wrappings and on his body. (See photo of bracelets from EMC-87, 239.) Ikram and Dodson note that Pinudjem's body was colored with ochre (perhaps red in color, cf. Masaharta above) and state that his body cavity had been packed with linen packets, some of which held sawdust while others contained the mummified viscera of the king. They also note that his arms had been packed with mud. Photo Credit: RM (Cairo, 1912,) pl. LXXXI. For high resolution photo of Pinudjem II see the University of Chicago's Electronic Open Stacks copy of Smith's The Royal Mummies (Cairo, 1912,) Call #: DT57.C2 vol59, plate LXXXI. Recent color photos of the mummy of Pinudjem II may be seen at the Eternal Egypt website.